This morning, I’ve taken the metro from Cardinal Lemoine to Odéon, where I’m standing on a street corner in the middle of rush hour traffic trying to get my bearings. I’m looking for 76 Rue de Seine, which is the Left Bank address of the famous Gérard Mulot. I have an unrivalled sweet tooth, so for me the pâtisseries of Paris are a kind of heaven, made up of pastel-colored macarons, flaky croissants, and buttery madeleines. This one comes highly recommended, mentioned appreciatively in guidebooks from Frommer’s to Lonely Planet and everywhere in between. When I reach the white awning above the shop window, I cautiously peer in. On display are giant cones covered in a rainbow of concentric circles, with rows of lemon yellow, turquoise blue, and pistachio green. 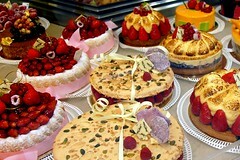 And then there are the cakes, piled high with meringue and fresh raspberries. It’s a feast for the eyes, but at the moment I’m more interested in satisfying my stomach. I settle on a pain au chocolat and a pastry filed with buttercream and carmelized hazelnuts—both wildly successful choices! Quite content, I make my way next to Gare Montparnasse to catch a train to Chartres. After I composter le billet in the yellow machine by the track, I settle in for an easy hour’s ride. 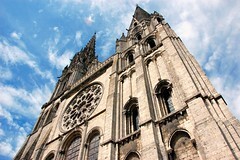 The gray spires of Chartres cathedral—curiously mismatched—dominate the skyline in town, drawing tourists like a magnet to the front doors of the church. I’m no sooner inside, adjusting my eyes to the dark, than I hear a familiar group of voices calling me from behind. 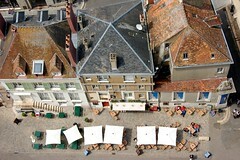 It’s Terry and Steve and the kids, who I met on the Battlebus tour in Normandy. We all laugh and enjoy the serendipity of the moment. I mean, really, what are the chances of running into each other quite by accident in a country of 62 million people, even if the itineraries of American tourists are much the same? Their departure a short time later leaves me on my own in the cathedral, and I begin to circle around with my neck craned high towards the windows. 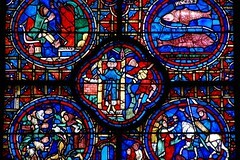 I’ve been drawn to medieval stained glass ever since a visit to the Victoria & Albert museum in London in the summer of 2006. I’ve seen fine examples at York Minster, at Sainte-Chapelle in Paris, and even at the The Cloisters in New York City, but these do not disappoint. The mass of scaffolding in the center of the church does, but the windows are lovely. There are signs of the zodiac rendered in colored glass—a scorpion, bull, crab, and ram—as well as scenes depicting various tradesmen at work—masons and stone cutters, wheelwrights and furriers. All are details that reward careful inspection. 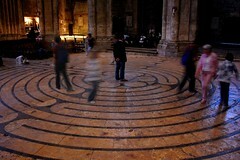 I had wanted to visit Chartres on a Friday, in particular, because of the cathedral’s famous labyrinth. On other days of the week it is covered by chairs, but on Fridays the chairs are removed to allow visitors to walk upon it, as pilgrims have done since the year 1200, either by foot or on their knees. According to the Malcolm Miller guidebook in the gift shop, it’s the oldest and best preserved of its kind from medieval France. I’m going to walk it myself, but for now I’m watching others take their turn. An older British couple has drawn my eye, mainly because they’re moving at an unexpectedly fast pace and their voices are echoing rather loudly. In a race to the end, the man instructs his wife to go left while he goes right, but moments later he’s sure that he’s lost and retraces his steps. I’m torn between impatience with the spectacle they’re creating and outright amusement. Someone really should take these folks by the arm and explain that it’s a L-A-B-Y-R-I-N-T-H, it’s not a maze. There are no trophies awarded to those who reach the center first, and for that matter, there is only one way in. It’s not a logistical challenge, it’s a spiritual exercise intended for contemplation, and they’ve missed the point entirely. Hoping for a different kind of experience, I begin my own walk slowly. I navigate the serpentine path and feel the unevenness of the marble beneath my feet, a channel worn away by centuries by repetitive motion. It has a subtle, calming effect, but it’s not exactly transcendental, in part because there are distractions all around me—a crowding of bodies, the sound of voices, the flash of cameras. Afterwards, the ascent to the top of the tower brings some welcome air into my lungs. Halfway up, I meet a little girl no more than 5 years old. She’s wearing a pink sweatshirt and a lavender beret on her adorable blond head, and she’s looking intently down at the stone supports that curve like ribs towards the belly of the cathedral. Her father asks if she knows what they’re called. “Of course,” she says, “flying buttresses.” When she looks up at the tower and at the stairs yet to be conquered, I lean in and ask her if she’s sure she can climb all the way. “Yes,” she says solemnly, because she has already climbed an even bigger tower in Geneva. 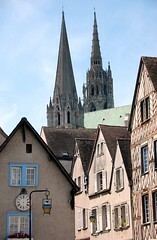 I end the afternoon by making a slow circle around the cathedral grounds, down the hill and through the town, stopping for a late lunch at Migeon. I order a chicken salad sandwich and point to a chocolate pastry in a glass case, but don’t much mind when through some act of miscommunication I end up with a steaming mug of hot chocolate instead. Back in Paris, the night is young and I am splurging at the Opéra Garnier with a prime ticket to a ballet inspired by Marcel Proust’s novel “In Search of Lost Time.” It’s titled, Proust ou les intermittences du coeur and it consists of a series of impressionistic tableaux that trace the author’s moods at various periods in his life, from times of great happiness to deep sorrow. Through my uncultivated eyes it seems disconnected and rather avant-garde, but the human body is a thing of beauty and great wonder, and I like the show very much. 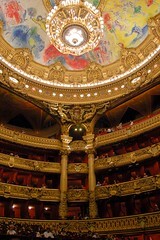 But even if I had not, the chance to sit in a chair of red velvet under a ceiling painted by Chagall, to see in the Palais Garnier the remains of La Belle Époque at its finest, that would be worth the price of admission on its own. 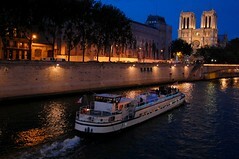 On the way back to the apartment, I stop to take a few pictures of Notre Dame and the Seine against the clear night sky. There is time enough yet to enjoy the “City of Lights,” but in the morning there will be rain.